There's a critter down Australia and New Guiney way that is sometimes called the spiny anteater. It's spiny, but not with sharp pointy quills like a porcupine. Also, it does eat ants somewhat, but is not closely related to anteaters. Seems gentle enough, but it's a protected wild animal, so don't be getting a notion to make a pet of one. Maybe consider a hedgehog and name it Spiny Norman, since there's a bit of resemblance. Anyway, the subject is the echidna (I kid you not, it's pronounced ee-KID-nuh), and is baffling to evolutionists, like its cousin the platypus. The classification for yon beastie is a monotreme. It's a mammal, but lays eggs. Yes, really. Read up on its alleged evolution and you get a whole whack of storytelling but no actual scientific evidence. Then they deny the Creator and resort to the nonsensical "convergent evolution" tale. Because of its unique characteristics and those of the platypus, it's not difficult to be suspicioning that God has a sense of humor and put some of these things on Earth to cause evolutionists to say, "I find this very troubling". You might think that spiky little animal waddling along the forest floor is a porcupine. But it has a long, sticky tongue and it digs for ants, so maybe it’s some kind of anteater. Nope? Well, it’s a mammal, at least, right? Wait—it lays eggs. Mammals don’t lay eggs. So what is this thing? The echidna seems to break all the rules. It’s a mammal, but it lays eggs. It’s warm-blooded, but it has a low body temperature. It lives on land, but it detects food like some fish do. And, like so many other rule-breakers, such as the platypus, the echidna settled in Australia. 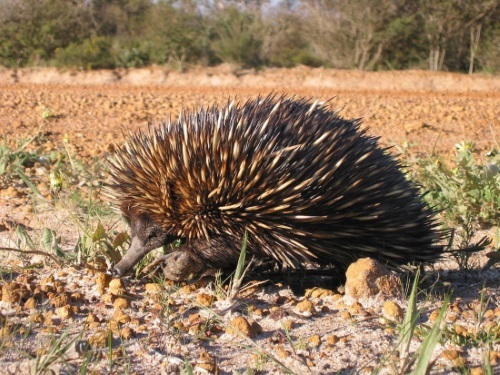 To read the rest, click on "Echidna—Outback Oddity" (audio version also available).